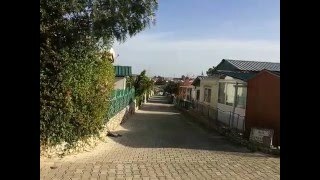 This is very much a site for 812 permanent caravans but it has relatively easy access to Lisbon (just under 20 km) via the motorway and the impressive bridge. It is very much favoured by the Portuguese themselves. The site has all the usual amenities and a village-like central bar and restaurant complex. Most of the amenities are open all year round. There is a small area for touring units containing about 18 pitches and some larger pitches for motorhomes. There are 20 mobile homes to rent. We see this site as useful for visiting Lisbon rather than for prolonged stays. 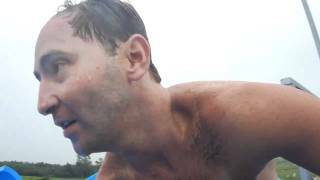 The site has a swimming pool and a tennis court, plus a gym. Activities and entertainment are organised for the residents of the permanent units. 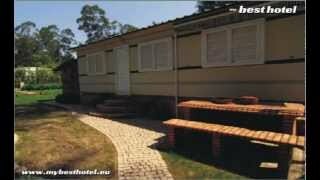 The single toilet block for the touring units provides acceptable facilities. Washing machines. Supermarket. Bar, restaurants and snack bar (all year). Swimming pool and children’s pool (1/5-30/9). Fitness facilities. Play area. Disco and other entertainment. From the A2 toll road take exit 2 onto the N378 towards Sesimbra. 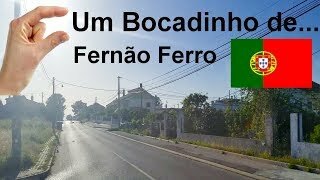 Pass through Fernão Ferro and at roundabout follow for Coina into Fontainhas. Stay on tarred road meandering through Fontainhas (rua 25 de Abril) and site is on the right.